Nanomaterials: Small particles, big trouble? Nanotechnology is proliferating in all aspects of modern life. Novel nanometre-scale materials are used in every-day products from cosmetics and medicines to fitness and food products. Research into the safety of these materials is lagging behind their technological applications, leading to concerns that products become available without due environmental and human health safety considerations. Furthermore, research into nanomaterial safety is marred by controversy. Consensus is lacking on laboratory methodologies, long-term studies are few, and approaches to develop nanomaterial groupings and models of activity are in their infancy. Thus, nanomaterials, despite their small size, are the source of big trouble. It has been more than 10 years since the term “nanosafety”, describing research into the potential health and environmental threats from nanomaterials and the development of safer alternatives (“safe by design”), became a regular feature of the scientific literature. Key to the recognition of the need for such research was an authoritative report published by the Royal Society and the Royal Academy of Engineering in 2004 (1), which presented in technical detail concerns about the risks of nanotechnology, particularly free engineered nanomaterials. Other major reviews followed, including EPA’s Nanotechnology White Paper in 2007 (2) and a report by the Royal Commission on Environmental Pollution in 2008 (3) that described the issues and lack of progress since the RS&RAE report (1). In 2012, the Royal Society of Chemistry published its own review of nanosafety, particularly focussing on the difficulties in developing legislation in the lack of sufficient and sound scientific evidence (Figure 1) (4). Concerns about the need for research, not only to understand potential hazards from nanomaterials, but also to develop an appropriate framework to regulate them, are well justified. An estimated 500 to 2,000 nanomaterials were placed on the EU market at volumes of at least 1 tonne/year in the period from 2012 to 2014 (5). This trend is likely to continue or even increase, and these nanomaterials are consequently affected by registration obligations under the chemicals’ safety framework known as REACH (Registration, Evaluation, Authorisation and Restriction of Chemicals), which entered into force in 2007. About 10% of these nanomaterials are untreated nanoforms of a bulk material that is already registered (5). Testing these nanomaterials and updating the registration dossiers would entail costs of between €50 million and €315 million based on the proposed amendments to REACH guidelines for nanoforms. Additional costs between €6 million and €38 million per nanomaterial are expected for the 450 to 1,800 surface-treated nanoforms (variants around a common core material), leading to total costs of up to €600 million to be borne by industry, mostly (around 80%) small and medium-sized enterprises (5). Development of a framework that would enable grouping and read-across approaches validated for nanomaterials is therefore a major research priority. In my 2015 ECG Distinguished Guest Lecture, I focus on two aspects of my research that are contributing to alleviating uncertainty on the safety of nanomaterials. Labelling relying on optical tracing. This involves fluorescent labels that are either grafted on the nanomaterial’s surface or (in the case of the very small quantum dots) result from the nanomaterial’s intrinsic fluorescence. Labelling relying on chemical tracing. Here, the label is a rare element or isotope that is usually introduced during nanoparticle synthesis and that is therefore homogeneously distributed in the nanomaterial. The development of a number of stable isotope-labelled nanomaterials enabled us to understand better the ecotoxicity of nanomaterials in experiments designed to simulate realistic exposure of organisms to nanomaterials. For example, the development (6) and testing (7) of ZnO nanoparticles labelled with the stable isotope 67Zn allowed us to show that zinc from isotopically modified ZnO nanoparticles is efficiently assimilated by freshwater snails (Figure 2) when ingested with food. Agglomeration of the nanoparticles did not reduce bioavailability and did not preclude toxicity. The ZnO nanoparticles damaged digestion. In more recent studies using isotopically labelled CuO (8) and Ag (9), we have demonstrated the increased sensitivity that isotopic labeling provides. This is important because experiments can now be performed at environmentally relevant concentrations. As a result, exposures are more realistic and the true toxicity mechanisms can be identified and distinguished from the result of excessive dosing. In the case of Ag nanoparticles, isotope mass balance calculations show that labelling increases tracing sensitivities at least 40 times and possibly up to 4000 times, compared to when the label is not present. This is despite having to use a silver isotope (107Ag) that is not particularly rare (approx. 52% of the elements total natural abundance). In the longer term, such labeling techniques could also be used to assign ownership of nanoparticles to particular manufacturers, thus contributing to future legislative traceability and accountability needs. Imaging of nanomaterials within organisms is also helpful for understanding their environmental impacts. I have described evidence of the internalisation of silver nanoparticles by the polychaete Nereis diversicolor after feeding on sediment spiked with either nanoparticulate or aqueous silver (10). The study indicated direct internalisation of silver nanoparticles. Importantly, silver delivered in dissolved form was internalised via different routes than were silver nanoparticles, and the two types of silver preparations had different in vivo fates. To establish mechanisms of uptake, we have used pharmacological inhibitors to block specific uptake pathways that have been implicated in the transport of metal nanoparticles and aqueous metal forms. This study, which focused on the mud snail Peringia ulvae, showed that nanoparticulate silver is taken up via multiple pathways and that these pathways are simultaneously active (11). More recently, we have monitored in detail the cellular uptake of titania (TiO2) nanoparticles into A549 (human epithelial) cells. This work demonstrated that the surface chemistry of nanomaterials plays a critical role in their cellular internalisation (Figure 3). A large body of recent work is contributing to a better understanding of the safety of nanomaterials. Acute toxicity effects discovered to date are generally limited. However, the quantitative data from experiments performed in realistic and environmentally/biologically relevant conditions remain too scarce to permit predictions of nanomaterial toxicity. 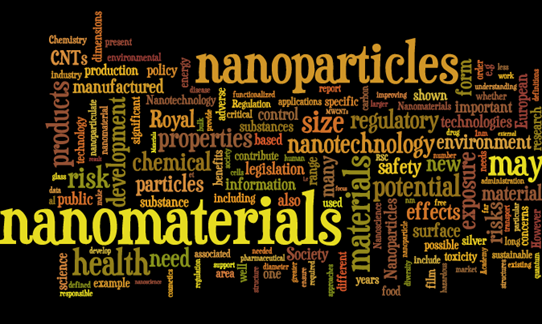 A framework to enable the regulation of nanomaterials has yet to emerge. 1. The Royal Society, London, Nanoscience and Nanotechnologies: Opportunities and Uncertainties, 2004. See www.nanotec.org.uk/report/‌Nano%20report%202004%20fin.pdf. 2. U.S. Environmental Protection Agency, Nanotechnology White Paper, 2007. See www.bdlaw.com/assets/htmldocuments/2007-02_‌EPA_Final_Nanotechnology_White_Paper.pdf. 3. The Royal Commission on Environmental Pollution, Novel Materials in the Environment: The case of nanotechnology, 2008. See www.gov.uk/‌government/uploads/system/uploads/attachment_data/file/228871/7468.pdf. 4. Royal Society of Chemistry, Nanotechnology Position Document, 2012. See www.rsc.org/images/Nano‌technology-Position-Consultation_tcm18-223077.pdf. 5. European Commission, Joint Research Centre Institute for Health and Consumer Protection, Ispra, Italy, Examination and assessment of consequences for industry, consumers, human health and the environment of possible options for changing the REACH requirements for nanomaterials, 2013. See ‪ec.europa.eu/‌DocsRoom/documents/11913/attachments/1/translations/en/renditions/pdf. 6. A. D. Dybowska, M.-N. Croteau, S. K. Misra, D. Berhanu, S. N. Luoma, P. Christian, P. O’Brien, E. Valsami-Jones, Environmental Pollution 159, 266 (2011). 7. M.-N. Croteau, A. D. Dybowska, S. N. Luoma, E. Valsami-Jones, Nanotoxicology 5, 79 (2011). 8. S. K. Misra, A. Dybowska, D. Berhanu, M. N. Croteau, S. N. Luoma, A. R. Boccaccini, E. Valsami-Jones, Environ. Sci. Technol. 46, 1216 (2012). 9. A. Laycock, B. Stolpe, I. Roemer, A. Dybowska, E. Valsami-Jones, J. R. Lead, M. Rehkaemper, Environmental Science-Nano 1, 271 (2014). 10. J. Garcia-Alonso, F. R. Khan, S. K. Misra, M. Turmaine, B. D. Smith, P. S. Rainbow, S. N. Luoma, E. Valsami-Jones, Environmental Science & Technology 45, 4630 (2011). 11. F. R. Khan, S. K. Misra, N. R. Bury, B. D. Smith, P. S. Rainbow, S. N. Luoma, E. Valsami-Jones, Nanotoxicology 9, 493 (2015).